Service provider session border controllers (SP-SBCs) are typically deployed in access or peering applications. In access applications, SP-SBCs provide security and QoS for residential VoBB- based traffic. In peering applications, they provide security and QoS features as VoIP traffic moves across SPs’ network borders.In VoLTE networks, an SBC sits in front of an IMS (and behind the Evolved Packet Core) to provide session management and security for VoLTE and/or RCS services, has become the primary growth driver of the SP-SBC market such that VoLTE-related deployments are now critical for vendors to gain and maintain SP-SBC share. 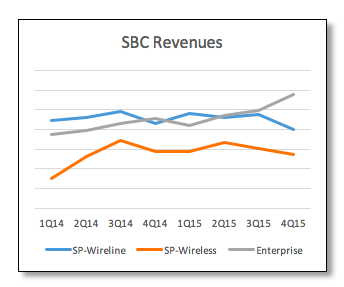 E-SBCs typically reside either at the enterprise, call center, or small and medium business (SMB) premises. E-SBCs provide security and QoS for SIP Trunks, connection services for enterprise-wide IP communications and IP-enabled contact centers, and security, interoperability and reliability required when delivering IP telephony, video, and UC across disparate, multi-vendor, multi-protocol IP networks. Exact Ventures has been publishing quarterly vendor market share reports for the SBC market since 2011.